Silverfish are gray to silver in color, approximately 10 – 25 mm long and have an abdomen, which resembles a fish tail. 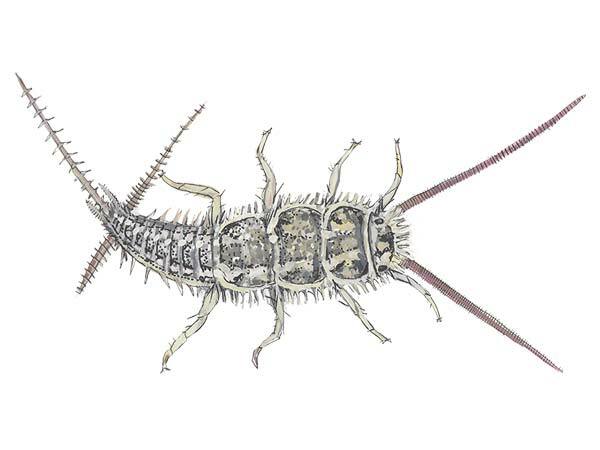 Silverfish have two long antennas on their head and 3 cerci or sensory organs at the end of their tail. Silverfish can accidentally be brought into homes through boxes of materials that were stored in infested areas. Silverfish can also move indoors from outside through small cracks or slight openings. Silverfish prefer warm and humid environments. They are common inside areas such as the laundry room, bathroom and under kitchen sinks. Silverfish run in quick bursts, then stop for short intervals before quickly busting again in a frantic sprint. Silverfish can live up to three years or more and can produce up to 50 offspring. The eggs are laid in small cracks or crevices and may take 20 – 40 days to hatch. The eggs are roughly 1/25 inch long and newly hatched silverfish are about 1/16 inch long. Silverfish reach maturity within three months and unlike most insects, they molt continuously throughout their life cycle. Silverfish are nocturnal and are usually seen in the evening hours. They leave their hiding places at night to seek food and water. Silverfish are considered resilient insects and can live up to 300 days without food, if water is available. When infested inside residential homes, silverfish prefer to eat dry foods such as cereal, pasta and pet food. Silverfish also have enzymes in their gut, which allow them to digest cellulose or paper products. Silverfish are notorious for feeding on paper, clothing and books. They can damage household items items such as book covers, important documents and even wallpaper. Since silverfish are nocturnal you will not see them in the daytime. Use glue traps to detect silverfish infestations. Place glue traps in areas with high moisture content or around the edge of the homes baseboards where silverfish will forage. Keep laundry rooms, garages and bathrooms dry. Silverfish like moisture. Clean the floors on a regular basis. Dust particles can contain enough food for silverfish to survive on. Seal up gaps near pipes and conduits with expanding foam. Thoroughly ventilate crawl spaces and attics to reduce moisture. Chemicals containing pyrethrins are effective in eradicating silverfish and can be applied in areas where silverfish are most active. Aerosol pyrethrins applicators provide easy access to hard to reach areas. Inorganic dust such as diatomaceous earth is effective in controlling silverfish and is less toxic than pyrethrins. Strategically place diatomaceous earth in dry locations. Focus on cracks, crevices, bookcases, windowsills, wall voids and other dark and tight areas. Warning: Pesticide is poisonous and should be handled by a pest control professional. Always read the label and follow instructions before use. We have been providing pest control services to Sarasota and Manatee counties for decades, including silverfish control Sarasota, silverfish control Bradenton, silverfish control Lido Key and nearby neighborhoods. Conclusion: We specialize in indoor silverfish control and getting rid of silverfish in the home. Call us today for a free inspection and quote.